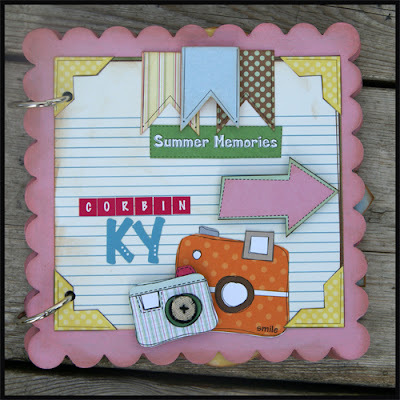 Stacy here sharing some projects using Nikki's Summer line. This line is so bright and fun, simply perfect for those summer photos. My first project is a gift card holder and the inspiration came from my daughter. She got her first job this summer at the best ice cream place here in the midwest. 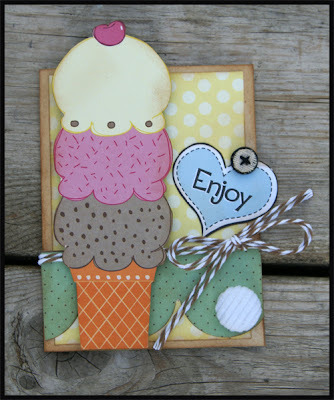 I thought this was a super cute way to give an ice cream gift card complete with an ice cream cone on the front! By the way did you know that July 15th was National Ice Cream Day....as yes I had an oreo malt :) Embellishing this little hold is a burlap button, cord brad, and some twine from The Twinery. Coolin' off is all part of summer fun, and this layout is showing just how much fun it is for the little ones to cool off. 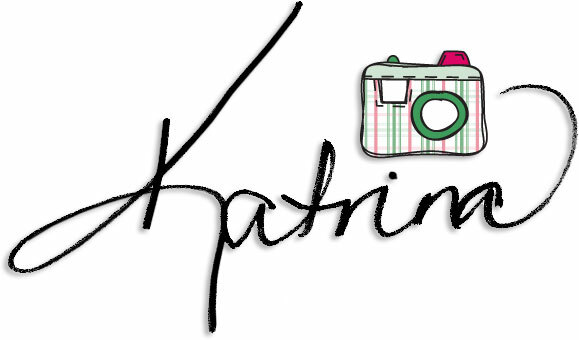 I love those little camera's, super cute and fun to add to any layout. I used some of the burlap buttons across the top along the banner. The clouds on the top of the layout came from cutting out the cloud from one of the papers in the line, then I simply traced it onto the layout. My last project I have to share with you is a little mini album. Now the inside of the album is not complete yet. My daughter is going on vacation with her friend and friends parents to Cobin KY next week. I'm a little nervous.....ok very nervous that she will be so far away but I know she will have a great time. I wanted to create a little thank you for the parents so i'm just waiting on the photos they will give me after the trip. For this album I mixed 3 of Nikki's chipboard albums. The covers and one insert are from the scallop square album. I painted the edges of this one with pink paint. Inside you will find a couple of pages from the crown & house mini albums. I placed them in the album sideways so i'm excited to see how it turns out. Thanks for stopping by today, hope you are all having a fabulous summer! 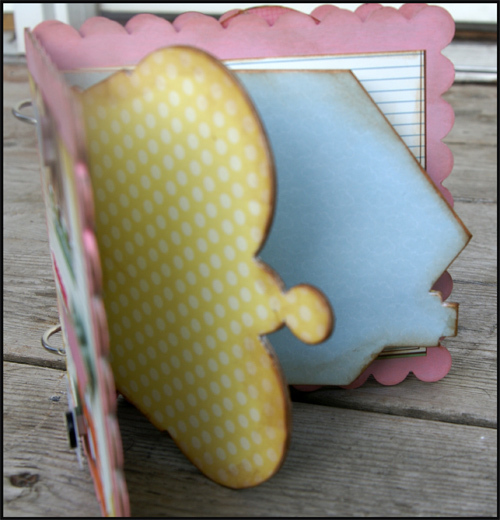 I am loving that idea of mixing the chipboard albums! Be sure to visit Stacy's blog! These are amazing Stacy!!! I loveeeeeeeeeeee how you used the different shapes for your mini!! I might have to try that! Thanks for the inspo!!!! Super cute projects!!! Love that mini!! !